Great Things I've Been Part Of! On October 17th, 2013, I took part in an event in Westminster, London, that showcased everything the Isle of Wight has to offer tourism, in an effort to gain more government funding for the tourism sector on the Island. 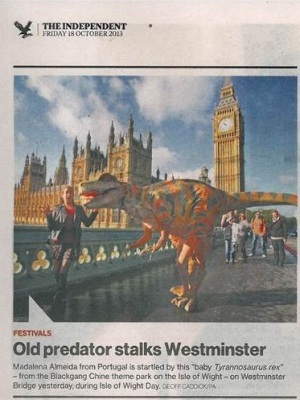 The event was incredibly successful as we had tourists, members of the public, and ministers alike, bemused and entertained by the excited character of Shadow, the baby T-Rex, as seen above. I have been working with Isle of Wight theatre company RedTIE Theatre for many years now, but in September of 2016 I was given my first freelance Actor role with the company. The paid work consisted of five days of intense workshop session with young people at the Isle of Wight College, where we performed a piece that asked: 'If you could see the film of your life, is it something you'd be proud of? The idea was to educate young people on the dangers of violence and substance abuse, and help them to change their lives while they have the chance. Launched on the 9th of August 2016, my first ever product was released to the world. 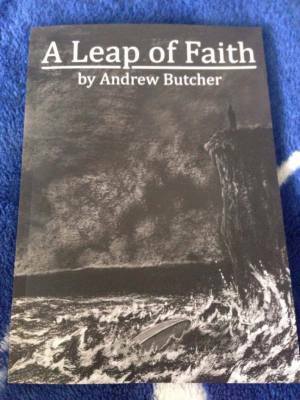 A Leap of Faith is an anthology of poetic and lyrical piece that I had been compiling since beginning study at the University of Winchester. This project spawned from the coincidence of my love and passion for poetic writing, and an amazing funding opportunity led by the Quay Arts Centre in Newport, on the Isle of Wight. A Leap of Faith is my first of many products, all of which you can see and purchase on this website!